It’s already that time of year to start thinking about back to school shopping! We are in love with these adorable, and affordable lunch bags made by Girls Can Tell. The 7-inch by 10.5-inch sized lunch bag is made with recycled cotton and has a velcro closure – it’s tall enough to fit a beverage bottle and is wide enough for a sandwich bag. It also has a nifty cotton string for carrying. All of the designs are hand created by the owner Sara Selepouchin. Girls Can Tell sells 8 different style lunch bags on their Etsy site. Our personal favorite, the Magical Unicorn bag, describes everything that makes a unicorn special with a sophisticated flare. The lunch bag is perfect for children and adults, though a child might enjoy coloring in the unicorn and rainbow! It's already that time of year to start thinking about back to school shopping! We are in love with these adorable, and affordable lunch bags made by Girls Can Tell. The 7-inch by 10.5-inch sized lunch bag is made with recycled cotton and has a velcro closure - it's tall enough to fit a beverage bottle and is wide enough for a sandwich bag. It also has a nifty cotton string for carrying. All of the designs are hand created by the owner Sara Selepouchin. Girls Can Tell sells 8 different style lunch bags on their Etsy site.�Our personal favorite, the Magical Unicorn bag, describes everything that makes a unicorn special with a�sophisticated�flare. 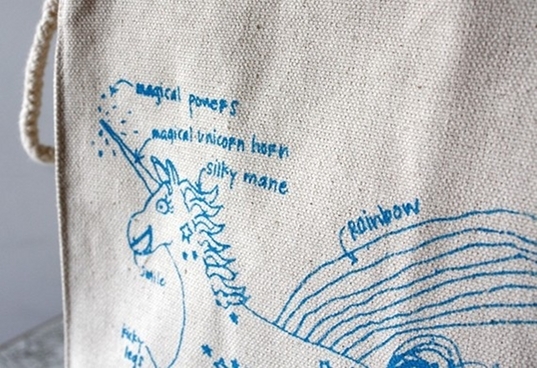 The lunch bag is perfect for children and adults, though a child might enjoy coloring in the unicorn and rainbow!